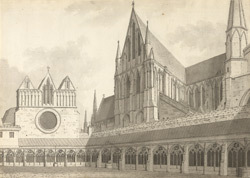 A view in ink of the cloisters, the west end of the chapterhouse, and the north-east end of the cathedral of Lincoln. Built in the early 13th century, the chapterhouse is one of the most ambitious buildings in the cathedral complex. It is a large polygonal chamber with a single central pier supporting the vault. Around the interior walls are a series of arcaded niches and a stone bench for clerics. Chapterhouses occur uniquely in Britain, and were the sites of the most important clerical business of the day. The cloister is an interesting feature, given that Lincoln Cathedral was never a monastic house. Unusually, it is on the north side of the building and its passages are in a recognisably 13th-century style, with carved wooden bosses. Sir Christopher Wren added a colonnade in the 17th century.